Uglyworld #290 - Resisting Temptation Isn't Easy (11/365), originally uploaded by www.bazpics.com. As you hopefully know by now, Wage has been t-total for quite some weeks now so with my birthday coming up this Wednesday there will be some beer involved and Babo was beginning to get concerned that Wage would fall back down the slippery path into comatosed evenings lying on the couch, floor, street or up a random tree snoring like crazy. Babo put together a simple test to check if Wage could resist the temptation by having a half litre of ice cold Weissen delivered to the room last night. Wage was drawn to the beer so badly, but only go this far with his outstretched arm before he remembered that he promised all the other little Uglies he wouldn't go back to his drunken ways!!! Babo decided that he passed the test and gave him a box of Jaffa Cakes to celebrate. 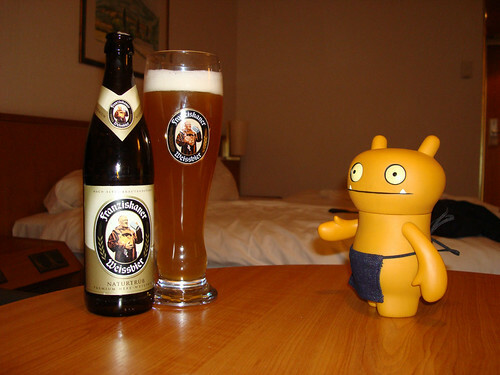 If you're new to these adventures, you can see the sort of incident the other Uglydolls wants to prevent a repeat of here and how they dealt with it here.